Back in 1996, shortly after we had moved to Columbus, this town went nuts over a movie at one of our arts theaters, the Drexel Grandview. The film was Big Night, written by and starring Stanley Tucci. Stanley is one of our South Salem, NY buddies--we'd see him frequently at the kids' soccer games, and occasionally, he'd mention this screenplay he was writing. Big Night turned out to be not only a big hit, but the true start of an amazing film career for him. Anyway, the local newspaper here in Columbus contacted Stanley's mom, Joan, and she offered up their family risotto recipe like the one in the movie. It's fabulous, and you can short-cut it with no loss of flavor by using chicken stock instead of the shellfish stock the Tuccis make. Either way works. Shortly after the movie, Joan and Stanley produced a cookbook, Cucina & Famiglia, with another acquaintance friend of mine, Mimi Taft. 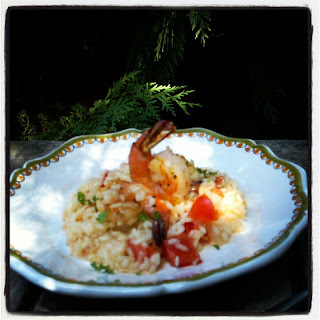 The shrimp risotto recipe is included in it, one of many good ones from a family well-versed in solid Italian cooking. Shellfish stock: Place shrimp shells in a large saucepan. Add whole chopped onion, carrot, celery, parsley and salt to taste. Add water. Simmer gently 25 minutes. Strain and discard shells and vegetables. Set broth aside and keep warm. Heat 2 tablespoons oil in a large skillet. Add shrimp and freshly ground pepper to taste. Saute just until shrimp are pink. Set aside. In a large pot or skillet, place 1 tablespoon unsalted butter and 2 tablespoons olive oil. Over medium heat, saute 1/4 cup chopped onion and the minced garlic. Do not brown. Add rice and stir to coat evenly. Add 1 cup shellfish stock (or chicken broth, if you are substituting), and cook, stirring frequently until rice has absorbed broth. Add wine, more broth, 1 cup at a time, stirring. Add tomato. Stir until rice is creamy and tender but still al dente, about 18 minutes. Add a little more broth if necessary, add the parmesan, check to see if additional salt is needed, and add freshly ground black pepper to taste. Add 1 tablespoon butter at the very end for extra creaminess. Serve immediately. Suggested soundtrack: Luciano Pavarotti's "Libiamo" from Verdi's "La Traviata"